Get an in-depth exploration of Russia during the fully-customizable private tour with included Russian visas and best hotels that covers it all! Traverse the ancient Golden Ring towns called "Russian Vatican". Enjoy the unmissable sights of both capitals, Moscow and St. Petersburg, including the Kremlin, Red Square, Peterhof, Catherine's Palace in Pushkin, as well as the Tretyakov Gallery and Hermitage Museum. Explore the gorgeous region of Karelia, its Kizhi Island and traditional villages. And to top it off, have fun during tours and activities like the Imperial Porcelain master class, a visit to the Vodka Museum, boat rides and night tours. This private Russian itinerary is what you've been looking for. Following breakfast, you enjoy a panoramic Moscow city tour. Today you have a chance to enjoy one of the best city views at Sparrow Hills and see the grand building of Moscow State University, the highest of seven Stalinist skyscrapers of Moscow. Following breakfast, you meet your guide at the hotel lobby and walk to the Kremlin territory where you have a chance to explore the gems hidden behind the Kremlin walls such as the Cathedral Square and the Assumption and Annunciation cathedrals. Then you visit the famous Armoury Chamber that houses a unique collection of crown jewels, stunning coronation finery, hand-forged armor and weapons, royal carriages and sleighs, and world-famous Fabergé eggs. After a short break for coffee, you take a walk through the beautiful Red Square, go inside the colorful St. Basil's Cathedral and explore the famous GUM department store. After the tour, you walk back to your hotel and have the rest of the day at leisure. After breakfast, you meet your guide at the hotel lobby and walk to the nearby subway station to take a short ride on the Moscow Subway and feel the taste of local life. In the morning after breakfast you meet with our representative. You are taken on an exclusive cooking class to get the real taste of Russia. 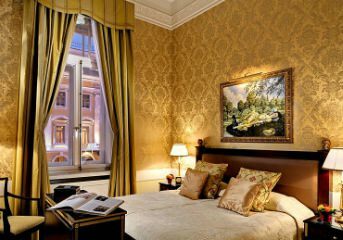 Following breakfast and check-out, your private driver meets you at the hotel lobby and transfers you to the Leningradsky train station for your departure to Saint-Petersburg. At the train station, you board the modern high-speed Sapsan train (Business class tickets are included) that takes you to Moscow in comfort and safety in just 4 hours. A meal onboard the train is included. Upon arrival, you are met by your private guide, who takes you on an amazing panoramic city tour around the most cherished gems of St. Petersburg with your private driver. Following breakfast and check-out you have some free time to continue exploring the city on your own or sign up for one of our carefully planned optional tours. In the late afternoon, you have a transfer to the train station for your train to Petrozavodsk. Upon arrival, walk to the hotel for check-in and have a good rest before your trip to Kizhi, planned for the next day. Today after breakfast meet your guide and walk to the pier along the embankment to board a hydrofoil that takes you to the breathtaking miracle of wooden architecture - Kizhi Island, where some scenes of the Anna Karenina movie were filmed. The duration of the transfer is about 1.5 hours. Upon arrival, you have a tour of the Open Air Museum Kizhi. During your walking tour, you explore its famous Pogost including the dazzling 22-domed Transfiguration Church built without a single nail, beautiful windmills, and ancient Russian wooden houses. After a short lunch stop, you visit a local carpentry restoration center. In the afternoon after the tour, you depart back to Petrozavodsk and have the rest of the day at leisure. Please note: the trip to Kizhi Island is subject to weather conditions. Hydrofoil to Kizhi Island is scheduled from May 15th to October 15th. Hovercraft for the winter period is scheduled from January 15 to April 1st. Following breakfast and check-out, you meet your private guide and driver to continue the journey. The first stop on the route is a village Manga with its small church of 19th century. Next, you proceed to Kinerma village where you meet a hostess for a welcoming tea ceremony with kalitki (Karelian traditional small pies) and varenye (whole-fruit preserve). One of the highlights of a day is a workshop of making such pies with a hostess. You also have time to stroll along the village to observe the houses of the 18th and 19th century built in local traditions and enjoy the beauty of Karelian nature before return to Petrozavodsk. Upon arrival, you have lunch and then you have a tour of the city. Witness the circle square dating back to the 18th century, the Governor's houses and walk along the picturesque embankment. After the tour, you are taken to the train station. Breakfast and welcoming tea ceremony treats included. This is the final day of your amazing trip to Russia! After breakfast you check out from your hotel and meet your private driver who takes you to the airport for your flight back home. Perceive the nature and the contrast of styles of lavish gardens of Peterhof and Pushkin during a leisure walk with your guide. Explore the wonders of Karelia Region, including the famous Kizhi Island and its wooden Pogost, the city of Petrozavodsk, and a Karelian traditional village. The prices above are valid for the tour from May till the end of September starting on Wednesdays, excluding May 27th, 2019.